Spot ethylene prices plunged in Asia during this past week. 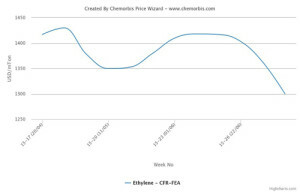 Although spot naphtha prices are suggesting only minor changes week over week, the steep drops in ethylene costs were due to easing supply levels as crackers resumed operations in June following maintenance shutdowns, according to ChemOrbis. 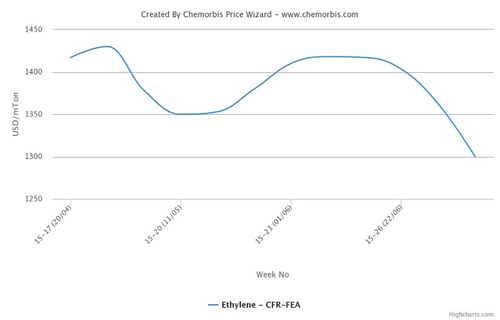 Spot ethylene prices slumped by around $100/ton on CFR Northeast Asia basis at the end of last week. Offers on a CFR Southeast Asia basis were also down by $110/ton week over week, according to players in the region. Supply was reported to be more ample in Southeast Asia so prices posted a slightly larger drop in this region. Players reported that supply levels rose following the ending of the turnaround season in Asia. During June, major Asian producers restarted their crackers, which account for a total ethylene capacity of over 3 million tons/year. China’s Dushanzi Petrochemical restarted their naphtha-fed steam crackers in Dushanzi, Xinjiang around mid-June. The two crackers, which have a combined ethylene capacity of around 1.2 million tons/year, were shut for annual maintenance around mid-April. YNCC’s No 1 cracker at Yeosu, South Korea resumed operations on June 16 as scheduled. The cracker, which is able to produce around 860,000 tons/year of ethylene, was shut for a month-long turnaround in mid-May. Japan’s Idemitsu Kosan also restarted their 620,000 tons/year Tokuyama cracker on June 21. Prior to the Tokuyama unit, the company’s Chiba cracker, which has an ethylene capacity of around 374,000 tons/year, had resumed operations on June 5. Mitsubishi Chemical restarted their Mizushima cracker in Japan in the last week of June following a shutdown for turnaround and expansion on May 20. The newly expanded cracker has an ethylene capacity of 570,000 tons/year. In addition to increased cracker output, overseas cargoes coming from the Middle Eastern suppliers were also cited as another factor weighing down on the market, according to ChemOrbis.